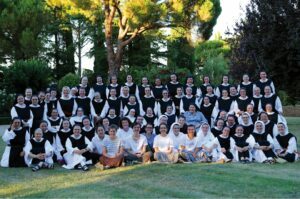 In 2016 CR began a friendship with the sisters of the Trappist convent of Vitorchiano in Italy. There have now been several visits, and we have discovered in them a relationship with Anglican religious communities that goes back a long way, including with CR. Sister Gabriella writes here about the history of this relationship. About 50 miles north of Rome, near the small mediaeval town of Vitorchiano, is the first Trappist convent in Italy, founded originally in 1875 in Turin, and transferred to Grottaferrata near Rome in 1898, moving to the present site in 1957. The Abbey, surrounded by about 75 acres of land, is self-supporting, producing wine and oil, jam and greetings cards, and produce of the vegetable garden and orchards. There are at this moment 80 sisters, ranging in age from 24 to 85. Love of the young and respect for the old, prescribed by St Benedict in his Rule, is something we live out with care. All the Community, in one way or another, is involved both in formation of the young sisters and care of the old, and we lay great store by dialogue together, as well as in generation-groups. 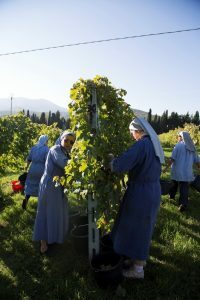 The sisters follow the Rule of St Benedict, according to the Cistercian and Trappist tradition: two reforms that over the centuries have renewed the Benedictine charism, emphasising contemplation and separation from the world, liturgical prayer, life together and manual work. At the heart of the Cistercian vocation is a life of conversion to the Lord, in daily experience, prayer, work, and human relationships, and in the effort to live according to the gospel. It is about learning to listen to the Word of the Lord and of the Church in liturgical and personal prayer, in lectio, in silence, in dialogue. It involves personal openness and a common life in obedience to the authority of the Abbot, in reciprocity amongst the sisters / brothers, and in stability in the monastery. The Second Vatican Council, was received and deeply embraced, thanks to the wisdom of the then Abbess, Mother Cristiana Piccardo, prompting new thinking on the ecclesial identity of our Community. We did a lot of work on the liturgy, both staying faithful to the tradition and in enriching it by singing the Psalms in the vernacular, and with new hymns, and encouraging greater participation and unity in prayer. Following what has been called an ecclesiology of Communion, we have discovered a greater simplicity of life together and of relationships. By putting an emphasis on personal responsibility, we have found greater commitment to the work that supports our life, which in turn builds up collaboration. We have an abundant flow of vocations, leading to many new foundations: the first one in 1968 at Valserena near Pisa, and then in Argentina (1973), Chile (1981), Venezuela (1982), Indonesia (1987), the Philippines (1995), the Czech Republic (2007) and soon a new house in Portugal. These in turn have made their own foundations in Syria, Angola, Nicaragua, Brazil, and Macao. One grace we have received is an ecumenical vocation that goes back in time to the witness of our sister Blessed Maria Gabriella Sagheddu (1914–1939), who gave her life for Christian unity. The ecumenical ideal already animated the Community when it was at Grottaferrata, under abbess Pia Gullini. In 1933, a young French woman, Henriette Ferrary, visited the Community and told Mother Pia of her commitment to conversion and prayer for Christian Unity, following the work begun in Lyon by Abbé Paul Couturier. Mother Pia took this up and shared it with the Sisters. There then began an exchange of letters between Couturier and ourselves, and in 1937 we made a commitment to prayer for unity, especially during the Week of Prayer for Christian Unity. An elderly sister, Maria dell’Immacolata, offered her life in prayer for unity, and Couturier would later remember her in his “list of martyrs for unity”, together with the Blessed Maria Gabriella we have already mentioned, and a Japanese Trappist brother. Sister Maria Gabriella, in unity week 1938, asked to offer her life too as a prayer for unity, and the Lord accepted it. Then, only 18 months later, in April 1939, on Good Shepherd Sunday, she died of tuberculosis. 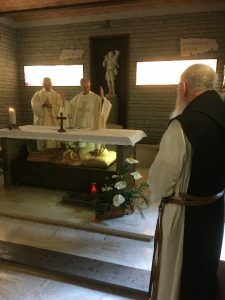 In 1938-39 a correspondence began with Nashdom Abbey, via Père Couturier, who had had a close relationship with Nashdom since 1935, when the then Abbot Martin Collett, the novice Guardian Benedict Ley, and Fr Gregory Dix, had taken part in the Week of Prayer for Christian Unity in Lyon. The first letter from Nashdom arrived at Grottaferrata (our then home) on 15 July 1938, on the occasion of the death of the aged sister Maria dell’Immacolata, who had offered her life for the cause of unity. There followed a long correspondence between the two communities, one letter thanking Sister Gabriella herself for her offering for the cause of unity. So there grew up a collaboration between the two abbeys, Anglican and Roman Catholic, with the desire to make known among Anglican communities the life and offering of the Blessed Gabriella. The Second World War saw the Nashdom monks transferred temporarily to Middlesex, turning their home over to Benedictine sisters from London who cared for the handicapped. This did not get in the way of the relationship which bound the two communities more and more together in the cause of unity, showing how monastic life and Christianity can triumph over separation caused by conflicts of nations. On 16 March 1947 Fr Ley announced he was coming to Italy to make the personal acquaintance of mother Pia, to visit Rome, and possibly meet the Holy Father. Accompanied by an oblate, Brother Francis de Sales, he arrived in Rome on 18th September 1947. On the 22nd he met Mgr Giovanni Battista Montini, under-Secretary of the Vatican Secretariat, departing with a promise of a report on the Anglican Church to contribute to mutual acquaintance. On 25 September they met Pope Pius XII. On returning to England, Fr. Benedict continued promoting contacts between women’s communities in the Church of England and our own convent, and he never ceased from referring on every occasion, public and private, to the meetings in Rome and the convent, and between 1948 and 1951 more than 50 Anglican Religious came to visit us. Père Couturier was glad of the relationship between Nashdom and Grottaferrata and he invited other communities too, including those less open to the Church of Rome, to have conversations with the Holy See in order to carry forward the dialogue that had been begun. Maurice Villain, Couturier’s biographer, says the first to respond was a theologian from the Community of the Resurrection, Fr Geoffrey Curtis, who was a cousin of Fr Benedict Ley. Fr Curtis brought an important and practical energy to the relations between the Anglican world and the Holy See, supported by Mgr Montini, who had now become Pope Paul VI. When Mother Pia stood down and transferred to an Abbey in Switzerland, the correspondence with Fr Benedict Ley and Nashdom was continued by Sister Fara, who had been involved with the Anglican brothers from the beginning. Fr Benedict died in 1964, but there were other important meetings, with Dom Augustine Morris and Abbot Wilfrid Weston. 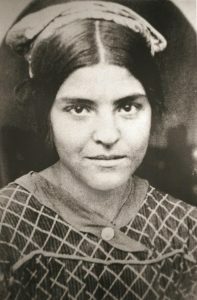 The latter was present in Rome when Blessed Gabriella’s self-sacrifice was recognised, and, after a visit to Vitorchiano in 1981, took part in her Beatification in St Paul-outside-the-walls in 1983. The last visit of a Nashdom Abbot, Dom Basil Matthews, was in 1988, but we keep up correspondence and communion in prayer. Now our communion with the Anglican Benedictine world lives above all in the friendship with the Community of the Resurrection Mirfield, born out of meetings with Fr George and Fr Oswin, and other brothers who have come here, and we now have an agreement to be united each month in our offering of the Eucharist for Christian Unity, coordinating dates so that we celebrate together on the same day.